Twilight Beetles, as their name suggests, can be found in the various 'twilight' areas of the game, where the cultists hang out. The sound they make when they're clicked sound like those of Silithid. They also come in a variety of colors, so you may want to take time to hunt for just the right one! Didn't see one of these right away so I started killing critters and within seconds one spawned. Level 3 grey. The Azshara area seems to be a good place to find one of these. Or even farm for a rare. They share spawns with the spiders and roaches in the area and have a decently fast respawn rate. Can even occassionaly have a Twilight Spider spawn. Edit: Just had one show up as a secondary to a roach. So they can show up as a secondary, but probably better to just kill the roaches and spiders and get one to spawn alone. The twilight guys are in the northeast corner of Azshara, near Sable Ridge. I also found one as a secondary add in Nordrassil, Mount Hyjal he was a poor, 24 level. I got one (admittedly a gray) as a secondary more than once when I was trying to farm a blue turquoise turtle in Azshara. They were also secondary once or twice to the shore crabs there. This is one of twenty beetles/roaches that have the exact same move set. However it is only one of two that comes in the pure attack (4/14) breed. The other is the Skarabäusjungtier. Both have 341 attack, but the Skarabäusjungtier swaps some speed for additional health. Either one is a must have for the fanatical collector. Do NOT farm for rares in Azshara, you are extremely unlikely to find any. The best zone for rare Twilight Beetles is without a doubt Deepholm. 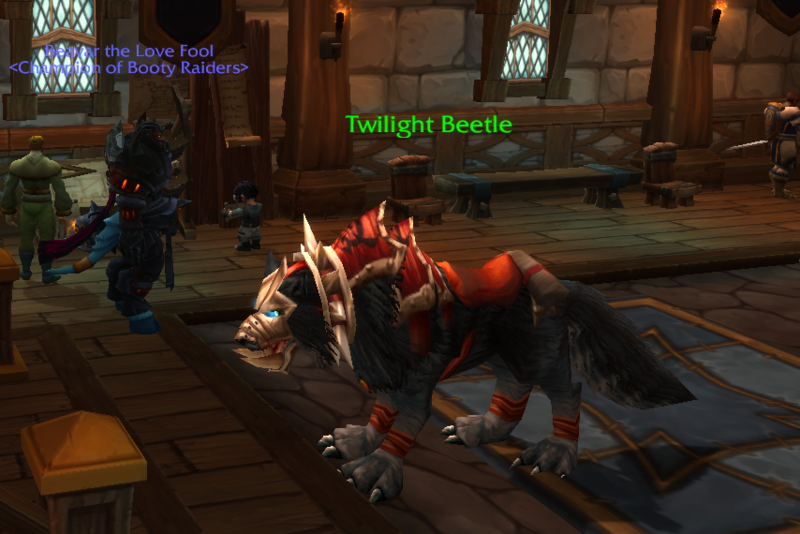 I have a wolf called Twilight Beetle strolling around my garrison. I'm adding a ss. So.. a "Twilight Beetle" showed up in my garrison (presumable because it's one of the pet's I've caught) but it looked a little... off. Dieser NPC befindet sich in Hyjal (28), Azshara (15) und Tiefenheim (4). Eine enigmatische Spezies, von der man sagt, sie nähre sich von den chaotischen Energien der Alten Götter.